The arrival of Santa Claus to the Jackie Clarke Collection and the spectacular switching on of the Christmas lights has just signalled the start of an extensive programme of festive fun in Ballina for the sixth annual Frosty which will run from now until December 31. The town’s annual Christmas festival is designed to celebrate the community and businesses of Ballina, and once again, the “support local” theme runs strongly through the programme. This year’s festival got underway on Sunday, November 25 with a fun-filled family day in the Jackie Clarke Collection, the biggest and best yet. Ballina’s stunning Christmas lights were switched on, ably assisted by the winners of the Jackie Clarke Collection’s Letter to Santa competition. Santa arrived in town, and was escorted by parade to his home in the newly redecorated Military Quarter where he will take up residence for the next two weekends, assisted by the Fifth Mayo Scouts. A major addition to this year’s festival is the inclusion of Ballina on the Coca-Cola National Christmas Truck Tour. Stopping at the Military Barracks in Ballina on the afternoon of Wednesday, November 12, the truck will delight families with its the iconic ‘Holidays are Coming’ jingle, made famous in their Christmas TV adverts. Featuring a glittering winter wonderland setting nestled amongst a festival of lights, visitors will be able to enjoy a can of Coca-Cola Zero Sugar, Diet Coke or Coca-Cola Original Taste while enjoying exclusive photography opportunities and creating magical memories that will last a lifetime. This year, Coke merchandise will be available to purchase with proceeds going to St. Vincent de Paul and each truck tour stop will encourage consumers to recycle their cans, in line with Coca-Cola’s World Without Waste global commitment to collect and recycle a bottle or can for each one sold by the year 2030. The Frosty Salmon Festival’s annual Mistletoe Market extends to two days this year and will take place on Saturday, December 8 and Sunday, December 9 from 12pm to 6pm daily under the canopy cover in the Military Quarter. A European-style market run by the Fifth Mayo Scouts, it will feature over 40 decorated stalls of local craft, artisan food, music and entertainment, with lots of opportunities to buy locally-made gifts and trinkets for Christmas. Bookings are now being taken by Ballina Chamber at 096 72800. Meanwhile, Santa’s Grotto will open on December 1 and 2 from 2pm to 4pm, December 8 and 9 from 2pm to 6pm, and on December 15, 16, 22 and 23 from 3pm to 6pm in the Military Barracks. Admission is €5 per child and each will receive a small gift. Irish Rail’s Polar Express Christmas Train runs on three dates this year – December 8, 15 and 22. Tickets sold out immediately upon announcement, and once again this special hour-long trip to Manulla and back with Santa and Mrs Claus on board promises to be a truly memorable experience for children of all ages. Tickets are now on sale from Ballina Train Station priced at €12.50 per person. 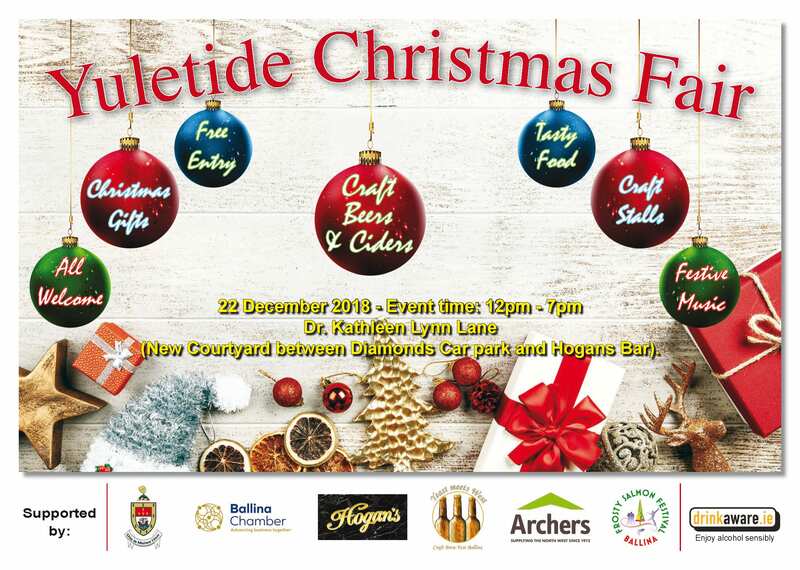 Also new to the programme this year is the Yuletide Fair, which will take place in the courtyard at Dr Kathleen Lynn Lane (off O’Rahilly St) from 12pm to 7pm on Saturday, December 22. featuring arts, crafts food and beverage, including some local craft brews. Ballina Chamber are once again selling Shop Local Vouchers, which can be redeemed in a large number of retail outlets in the town including food and restaurant outlets, and can also be exchanged for services such as beauty treatments, car repairs, even plumbing. Unlike with larger voucher schemes there is no administration fee. Vouchers are available all year round in denominations of €10, €25 and €50 and make an ideal Christmas gift or bonus. A list of participants is available on www.ballina.ie. The Ballina Chamber Christmas Cracker Bonanza Draw also takes place with €10,000 in local voucher giveaways on offer. Shoppers can enter as they buy in various outlets around Ballina. Draws take place on December 7, 14 and 19 to give people time to spend their vouchers before Christmas. Finally, Mayo County Council is once again offering free parking from 2pm every day in December in all council-owned car parks. Pay and display will be operational as normal on the streets during this period. 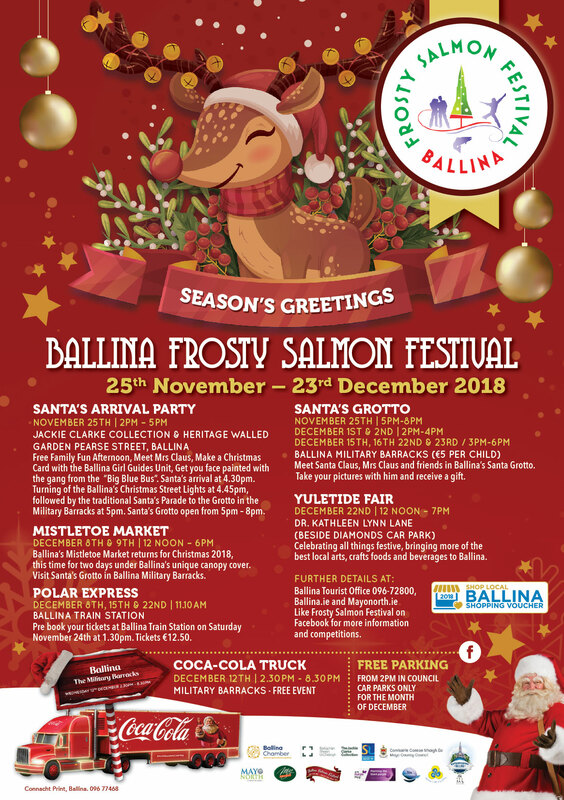 The Frosty Salmon Festival Ballina is led by Ballina Chamber and supported by a number of groups and businesses including Ballina Beverages, Moy Valley Resources IRD, Mayo North East TÚS, Mayo North and Mayo County Council. 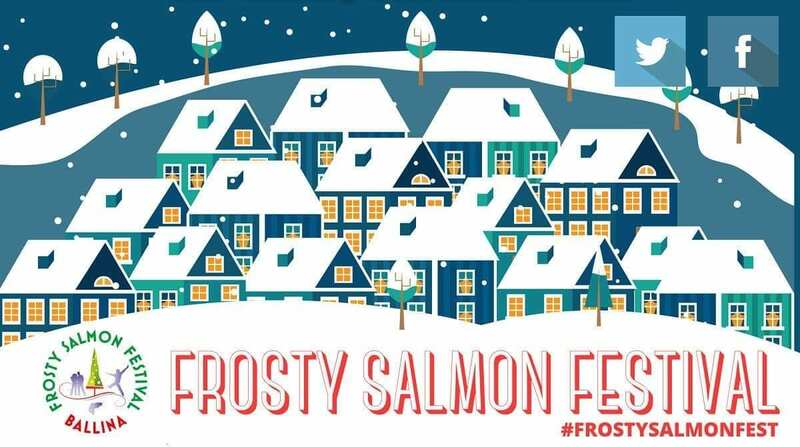 For more information on the Frosty Salmon Festival, visit www.ballina.ie , Frosty Salmon Festival Ballina on Facebook or contact Ballina Chamber on 096 72800.